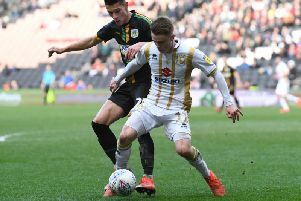 It's not just Osman Sow who is excited to see him back on the football pitch for MK Dons, but his manager and team-mates too. The Swedish striker's career at Stadium MK has been severely hampered by injuries since he signed in August 2017, limiting him to just 26 appearances. Having made just seven appearances in 2018 heading in to December, Sow has been dripped back into first team competition, making four appearances since December 8 - all of them from the bench. His training schedule has been tinkered in a bid to keep him as fit as possible - something which Sow is thankful for. He said: "I have to say a massive thanks to the backroom staff – Simon and Adam and Tom – now I'm feeling good, taking it one day at a time and trying to improve my sharpness. "I've really enjoyed playing, enjoying the moment and help the team. If I play, if I don't play, just help get the points. "All minutes are valuable for me at the moment, I'm just trying to tick along." Having scored in the 6-0 win over Cambridge on New Year's Day, Sow was a brief substitute against Bury on Saturday before getting 66 minutes in the Development League win over AFC Wimbledon on Monday. Alex Gilbey, who spent six months in the treatment room at the beginning of 2018 with Sow, said: "Osman has worked so hard, he’s had ups and downs, but to see him out there scoring goals is massive – that’s big for him – long may it continue. "It feels brilliant, I built a great relationship with Osman off the pitch, we worked hard together, for him to keep getting knock backs was upsetting to see considering how good he is. Now, he’s feeling the best he’s felt for a few years – I know he’ll score goals for us. "The physios have a thing in place for him, if we can keep him fit and firing, we’ve got a very fit striker on our hands." And should he be able to stay fit, manager Paul Tisdale feels he will have a strong asset on his hands. Tisdale added: "We've not seen much of Osman, but he's more than good enough and hopefully he can stay fit and focused and as wonderful as he has been in the last few months in trying to be the best he can be. I'd be very happy if he does."